Ingenious is a game that many people seem to genuinely like – I’m just not one of them. I’ve had passably entertaining times playing it but for the most part I can’t remember a single moment from any session. That’s – not a great sign. 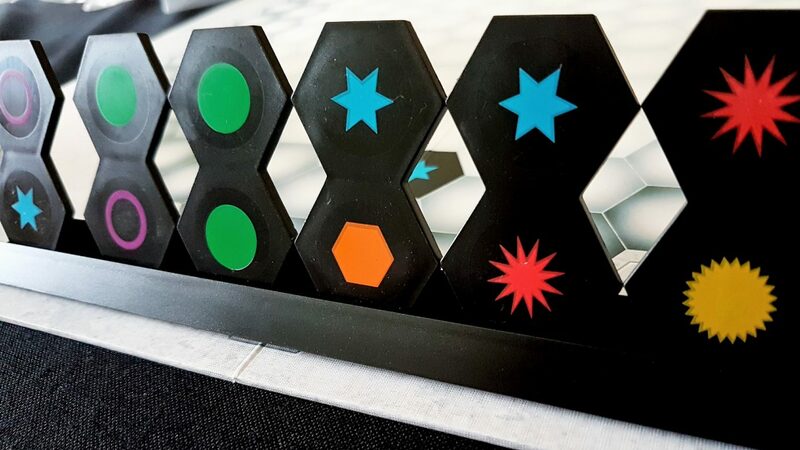 We gave Ingenious two and a half stars in our review– it’s aggressively okay, which is something of a cardinal sin in modern board gaming. Nobody has to settle for okay any more. The competition is too intense for sufficiency to be sufficient. That wasn’t true when Ingenious was released back in 2004 when we didn’t have historical records, but it’s true now and now is when you’d be considering buying it. Enough mean-spirited sniping from me though. Whether Ingenious is a genius game or not is irrelevant. Our question now is with regards to whether you can play it. Is ingenious inaccessible? Let’s find out! Ingenious is a (mostly) textbook example of how to handle colour blindness correctly. I say mostly because colour is an important channel of information and the board becomes a little bit more difficult to instantly parse if those cues aren’t available. 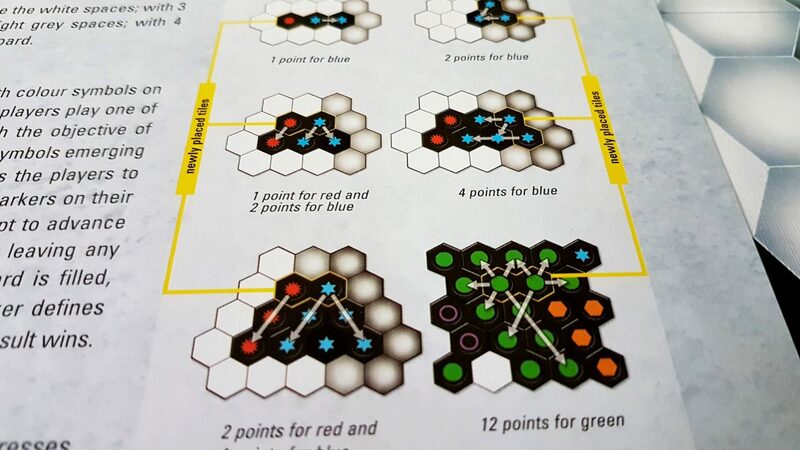 Seeing how hexes fit together is important to fluid play, and parts of the board blend together into an overlapping palette for all categories of colour blindness. This is though a small problem because Ingenious does the only real thing you need to do in order to cleanly support players with colour-blindness – it never relies on colour as the only channel of information. Every different colour on the board has a different symbol. Where there is a serious risk of a palette overlap is also where the symbols tend to be especially distinctive. Consider for example the serrated circle and the hexagon. Their silhouettes are sufficiently distinct as to ensure that the task of visual parsing is as easy as it can be. See, it’s all okay up close! For the scoring, pegs are slotted into a cardboard peg board. The pegs are all identified only by colour, which may make setup a little bit trickier than it has to be unless a player with full colour discrimination is happy to handle this part of the game. It doesn’t really matter too much though because each of the pegs has the appropriate symbol at the left hand edge, and it’s easy to trace along to see which peg belongs to the symbol. Having the wrong colour peg in a particular lane of the board would be confusing to anyone else playing, but it wouldn’t have any other impact on game flow. We strongly recommend Ingenious in this category. 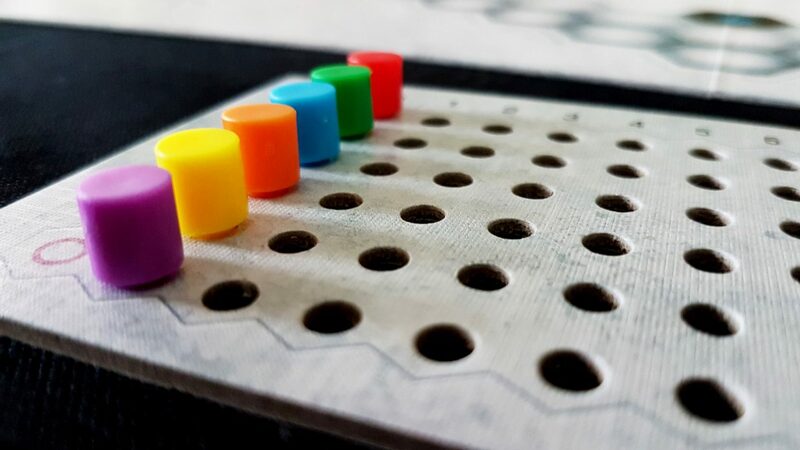 The peg-board for scoring is pleasingly tactile, but aside from that Ingenious is going to be a game that is almost impossible for anyone with total blindness to play. 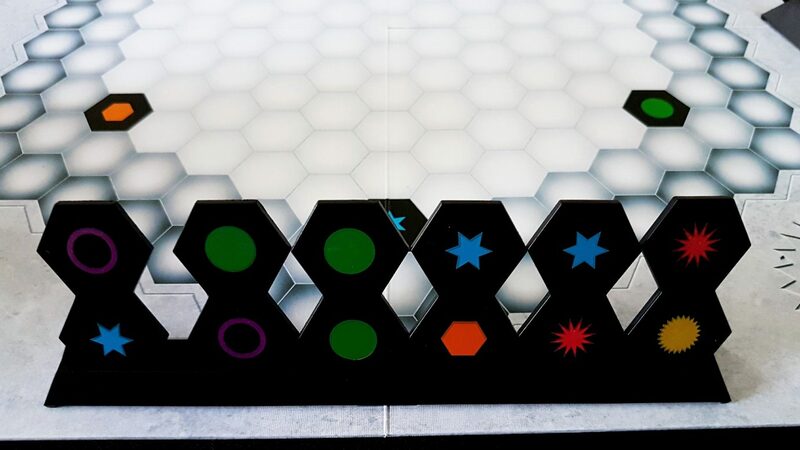 There are no differentiating marks on the hexes and as such the board offers no information other than visual for the state of play or the hexes available to a player on their tray. For those with less severe visual impairments the story is a little more positive but not overly so. The pieces are very well contrasted and when compared against the board there is no uncertainty as to where they’ve been placed. The difference between ‘empty board’ and ‘covered board’ is about as clear as it could be. The board isn’t especially big, but the real problem is that it doesn’t yield itself well to physical inspection because the state is intensely fragile. 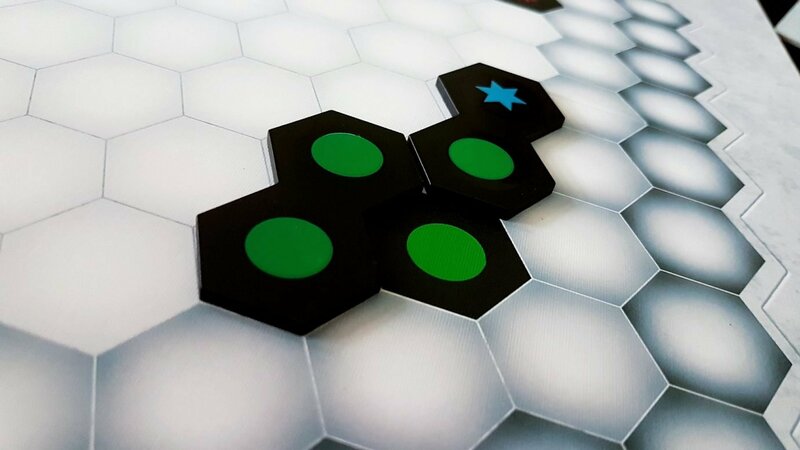 The hexes are plastic, and they’re very lightweight – nudging even one of them is likely to cause pieces to scatter in all directions. It’s easy enough to repair the damage since the game state isn’t complex but it’s still a risk you have to take in order to be able to get up close for investigative purposes. Even leaning too heavily across a table can dislodge some pieces. 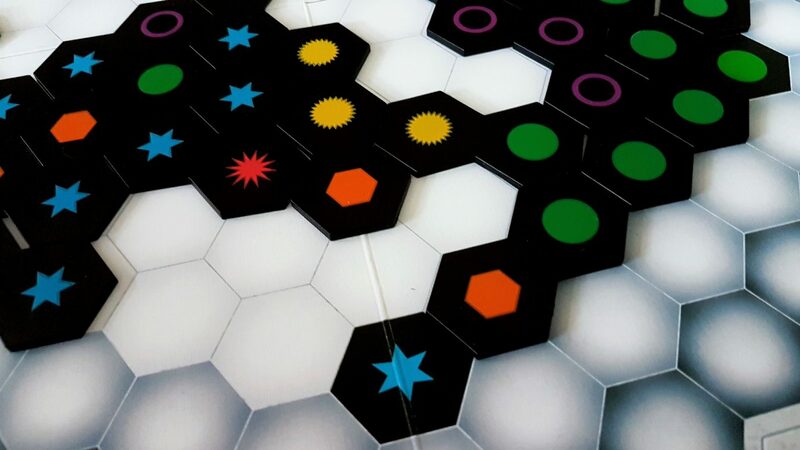 More than this, assessing hexes for placement depends on being able to trace straight lines from the different colours on your hex, and that in turn requires you to be able to differentiate clusters of tiles – usually at a distance. To take in the full state of play and pick an optimal location for a tile you need to assess the board as a whole. Colours, because they are quite distinctive, will likely group together in an identifiable way for those with minor to moderate visual impairments. The specifics of direction and adjacency may be a little harder to unpick. Coupled to this is the need to know where your opponents are likely to be looking to place their hexes so you can attempt to block their access. The winner isn’t the person that accumulates the highest score in the colours – it’s the person that doesn’t have the lowest score in any colour. Being able to manipulate that odd scoring quirk for your own purposes needs you to see what people have on their peg-boards, which may be difficult. It also needs you to see where might be the most sensible places where your opponents will be looking to be active. You can inquire as to score, but in doing so you might reveal your intentions and provoke them into action before you would like. ‘I have seven green, eleven red, and oh… one orange, I better fix that’. Sometimes your game plan, such as it is, will depend on people not being made aware of where they are weak until it’s too late. We don’t recommend Ingenious in this category, although with the use of an assistive aid and close examination of the board we believe it is probably playable with care. Despite being a game that is a Mensa Select winner, it doesn’t ask an awful lot of its players in terms of cognitive faculties. Memory is well served since your score is represented in a peg board; your hexes are physically present on a tray; and the board offers a full reminder of what has been played before. There’s no distinction between ‘your tiles’ and ‘my tiles’ after they’ve been placed. As soon as they leave your tray they become communal game state. The nature of random draws of tiles from the bag and the sheer number of these mean memorization isn’t particularly feasible or even especially useful. The core cognitive cost comes in the numeracy associated with play and how that manifests in scoring. The peg board simplifies this considerably since it gives a physical manifestation of a number line someone can move a peg along. More problematic is the more implicit numeracy that goes along with evaluating tile placement. You get a point for each individual straight line you can trace from a hex segment, and you get the points for each matching colour you can trace from the origin without hitting a different colour. As such, a single placement might involve several individual (albeit simple) sums. Making a good move is a process of mentally evaluating each option you have before making the play. Much of this can be intuitive, based on the clustering of colours – this will permit you to make a good move, although perhaps not the optimal one. However, Ingenious also isn’t a game where you necessarily need to be doing well every turn – you just need to make sure you’re not holding the bag for having the lowest value reflected in any individual score track. If this is likely to be a difficult element for players, more familiar scoring variant mechanics can be introduced although note this will have a significant impact on the tenor and flavour of the experience. The game flow is reasonably consistent with the sole exception being when someone reaches eighteen points in a colour track and gets their Ingenious bonus. At that point they get to take an extra turn, and if they can accomplish that several times in a row they get several bonus turns. This is the only part of the game where you need to consider ‘clever’ chains of tiles, or a break in the fixed sequence of play. Overall then, we’ll recommend Ingenious for those with fluid intelligence accessibility requirements, and strongly recommend it for those for whom memory is a key consideration. There isn’t really much to worry about here. Ingenious, while an unabashedly abstract game of logic, doesn’t have anything approaching the social cachet of something like Chess. If you lose at chess it can be perceived (incorrectly) as being linked to a deficit of intelligence. Ingenious occupies a completely different design niche and so losses don’t have that additional pressure of cultural connotation. The peculiar scoring system too offers people plenty of room for emotional cover – the winner is not necessarily the person that played best, just the one that played most conservatively and cautiously. It’s possible for a player to reap in dozens of points turn after turn and yet still lose. That doesn’t feel as damaging as playing poorly and then losing. Players can certainly attempt to block each other from certain colours, and there is scope for people ganging up to undermine a single individual. 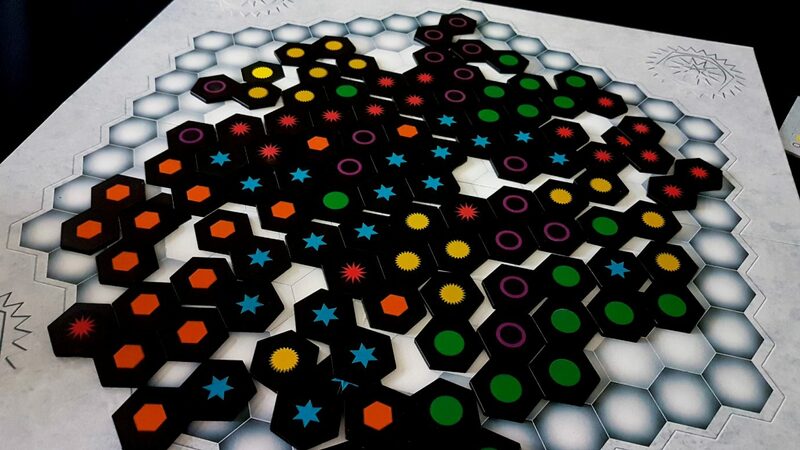 It’s difficult to do though and the nature of the expanding board means that the more players there are to gang up, the harder it is to block off the colours you need. 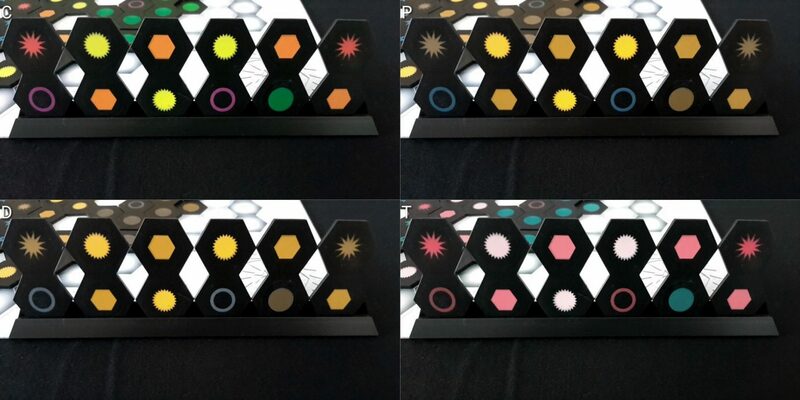 For four players, a block of colours might need to be surrounded on six sides. In a two player game, it might only be on three. There are no challenging themes or content in Ingenious – indeed, there’s really no theme at all. There are no take that mechanics, no player elimination, and the scoring system means that while significant score disparities are possible they are not necessarily coupled to winning. 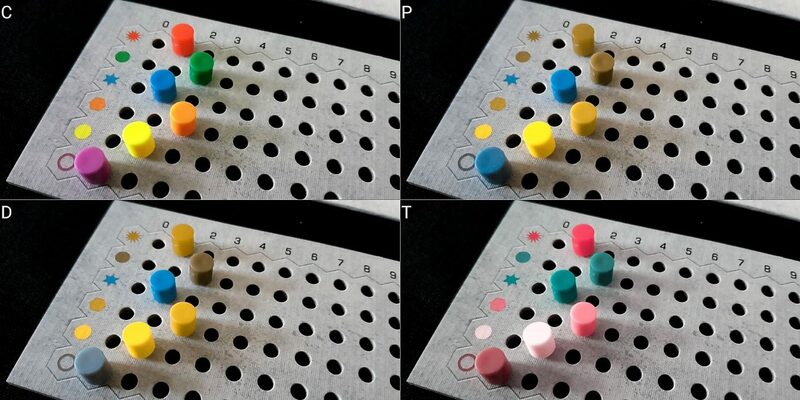 While one player may have five colours at eighteen, it’s the one they don’t that determines what their actual score is. Pleasingly, Ingenious comes with physical racks for the tiles. This is a rare luxury, but one that really makes a difference as far as physical accessibility goes. For exactly the same reason why card holders are important for games with cards, this rack is very valuable for the plastic hexes the game uses. Due to the nature of placement, it’s also often the case that you’ll be trying to place a hex so that it nestles against other hexes, and often in a way that will result in it being surrounded on multiple sides. The best moves are those that take advantage of deep connectivity of the colours and as such you’ll be prioritising those locations of the board that are least physically accessible. The problem here is that if the placement of the tiles has not been perfect then you won’t even be able to cleanly fit the tile where it’s supposed to go – attempting to tidy up the immediate area is a brave move because a single spasm or jerk there might send tiles everywhere. The scoreboard you get is both a blessing and a curse. The pegs you get fit snugly into the slots left for them, which means they are very secure once they’re in place. You could throw a peg board like a Frisbee and they wouldn’t come loose. The bad news is that it requires a degree of force and a fair bit of precision to remove them and move them once they’re in place. The peg boards are only cardboard too, and have a tendency to pucker and distort under pressure. As such, the game is a problem for those with gross and fine grained motor impairments. Turning to verbalisation we find it’s another area where players are likely to have difficulty. It’s not a huge board, but it is a complex board and specific positioning is important. 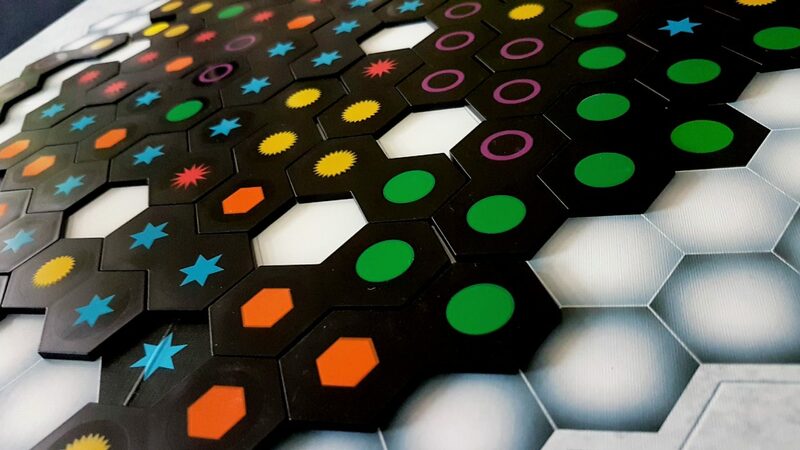 The board comes with no co-ordinates or features other than the fixed starter hexes, and increasingly it becomes difficult if not impossible to precisely articulate where hexes should go. Orientation is incredibly important too meaning that you’ll be trying to get someone to take a specific tile from your rack in a specific orientation and placing it in a board with no clear identifiers other than what you might invent for yourself. Which symbol do you want to place beside which symbol in which orientation? How do you describe where you want it to go? You’d need to say something like ‘next to the purple circles on the right side, no my right, oriented with the purple tile connecting the three purples and the green one connecting the three yellows’. It’s possible, but becomes increasingly cumbersome as the board state changes. What if there are three clusters of purple in the same location, or one cluster with multiple places you might want to place the hex? What if we want to place a blue star at the bottom – there are two possible locations with two possible orientations. That’s possible to just brute force with an exhaustive search of possibiities. What if we want to place it at the top? That’s a much more open location with many more potential options. I’m not saying verbalisation is impossible, just that it is going to be very time consuming and cumbersome. You could adopt a co-ordinate system of your own (and indeed, even write it directly onto the board) but the game doesn’t make it particularly easy to do and you’re going to need a system that is flexible enough to deal with the changing board size at different player counts. There are 22 hexes height-wise and 16 width-wise. That makes for an unwieldy system, but it’s certainly something you could do if the will was there. Overall though we don’t recommend Ingenious in this category. There are almost no problems here. The game is entirely abstract, with no issues of representation. The manual defaults to masculinity in the text, which is the sole criticism I have to levy with regards to gender portrayal. Cost wise, it’s a reasonable £25 at RRP and plays well from two to four – the board scales to meet the player numbers, so you get a different but equally valid experience at all counts. Four players is a low ceiling though making Ingenious a potentially difficult proposition for larger family nights. This is especially a problem for a game that explicitly sells itself as a ‘strategy game for all the family’. As simple as it is, it’s got a surprising amount of low-key staying power. It’s not a game that I’d necessarily choose to play if I had a selection available, but I don’t begrudge it the time I have invested. It’s unlikely to be a firm favourite, but it’s also likely to be something with broad applicability given its easy learning curve. I should point out here too that the game is also available in a re-implemented form under the title Axio – as far as I know the only significant difference is you play square hexes into a grid rather than hexes into a hexagon. The RRP of that is around £28 so if you are having difficulty finding Ingenious you can look for Axio instead. We recommend Ingenious in this category. There’s no need for literacy, and no requirement for formal communication during play. If you wanted to play in stony silence save for a Vangelis soundtrack playing in the background, you’d be no worse off. 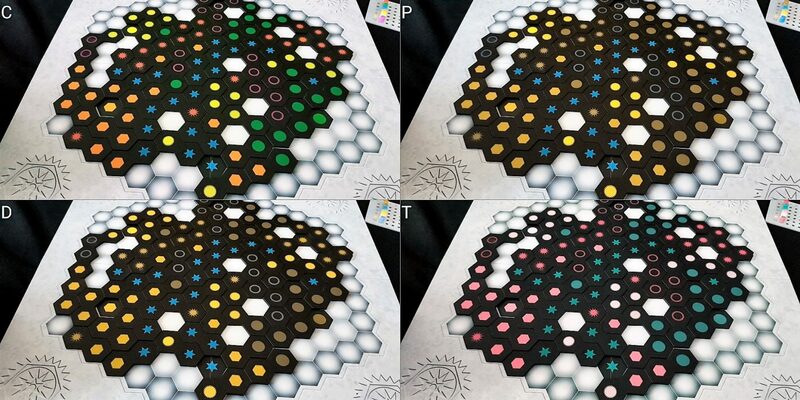 Colour is such an important part of ascertaining game state that even if visual impairments are minor, an intersecting colour blindness condition would be enough for us to suggest you avoid the game. We already advise those with visual impairments to explore elsewhere for their accessible fun, but we acknowledge that the game probably can be played if you want to make the effort. If colour blindness has to be taken into consideration, we’d no longer be willing to make that claim. There are hidden hands of tiles in the game, but they are very visually distinct and have no cognitive complexity to go with them – it’s about symbol matching with no special effects associated with individual colours. As such, the usual intersectional issues associated with hidden hands and the combination of physical, visual or cognitive impairments don’t apply here. Similarly, the symbols used on the tiles would usually be an issue for those with visual and cognitive impairments were they do have special effects – that’s not something we need to take into account given what the symbols represent here. The game is over in a reasonably brisk period of time – I’d estimate even a four player game is over and done within about fifty minutes. You might want to give a little leeway there for taking into account accessibility compensations. It’s not long enough to be a serious contributory factor in exacerbating physical or emotional distress or discomfort. However, even if a player has to drop out it needn’t interfere with play. The only game state elements that are unique to a player are their score and their tile rack so someone no longer participating in play would simply miss their turns while everyone else keeps going. There are some implications for board state but they needn’t be a deal breaker. Should a two player game drop down to a one player game it’s even possible to play Ingenious as a solo experience to the end. Aside from its problems for those with physical and visual impairments Ingenious actually manages a fairly strong showing here. Perhaps most surprising is that a game branded in some parts of the world as ‘Mensa Connections’ is such a cognitively accessible game. That’s not to say there isn’t scope for deep, tactical thinking when playing Ingenious – just to say that it’s not necessary to enjoy the experience. There’s a lot to like here – the tile racks are a great addition, offering the benefits of a card holder that works specifically for the non-standard dimensions of the hexes. Unfortunately it’s not enough to offset the other physical accessibility problems but I’d be keen to see this kind of thing emulated in other games. The easy nature of play and the abstraction of the theme ensure that it doesn’t make any major blunders in the emotional or socioeconomic categories either. There are some easy accessibility wins available though if someone should want to take that into account for a future revised version. Ingenious is a perfectly okay game. I have no strong feelings about it at all and that’s why it hit the perfect average of two and a half stars in our review. I enjoy it passably well when I’m playing it, and spend zero time thinking about it when I’m not. That’s not exactly a ringing endorsement I know. I firmly believe though that you too, if you wanted, could be equally indifferent to its place in your collection should you decide it meets your particular accessibility requirements.